Back from the pony convention! Not that I was really gone, since I live here, but whatever. For those of you who don’t know, Everfree NW is the local My Little Pony convention. I used to watch the original My Little Pony back in the early 80s, though I find that one doesn’t really hold up that well now that I’m an adult. But the new version of the show, My Little Pony: Friendship is Magic, is AMAZING. It’s on Netflix. Go check it out if you’ve never seen it. Anyway, this was my first time at Everfree and my first time being a vendor at a con. 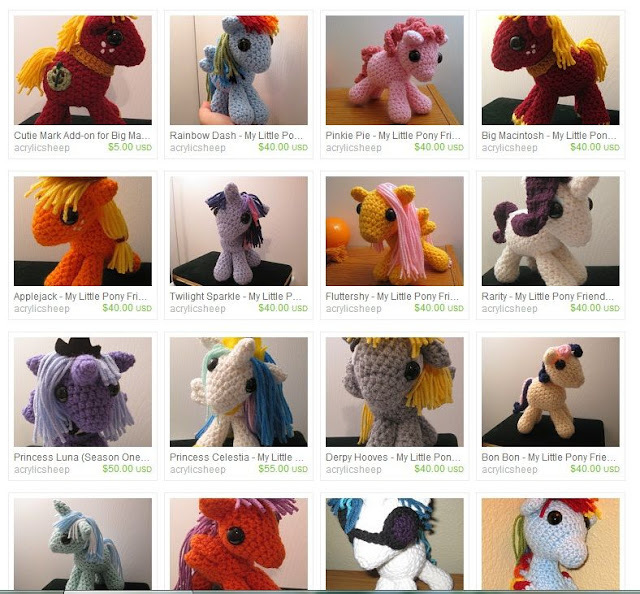 (I make crocheted pony plushies.) I only saw the dealer’s room, but that’s my favorite part of conventions, plus the con pretty much came to me. VIPs from the show came by and complimented my ponies. The people from Friendship is Witchcraft stopped by, too (they re-edit episodes of the show and dub over them and it’s HILARIOUS and my favorite fan-made thing). And Peter New, the voice of Big Macintosh, came by and let me take a pic of him with my Big Macintosh plushie. There was also a Sweet Apple Acres booth on the other side of the vendor’s hall, and a lady dressed up like Granny Smith. Every so often she’d shout that it was Cider Season, and for a limited time they’d sell little bottles of Apple Family cider, just like on the show. It was good times. And from my booth I met lots of cool people and saw lots of amazing costumes. I had some Renegade X bookmarks on my table and told a few people that I was a writer and gave them one. Which was maybe a mistake, because I kept getting that, “Oh God, not another terrible writer–please strike me down before they start talking about their book!” look from people, which I haven’t gotten since before I was published. It wasn’t all their fault, though, since I’m horrible at telling people about my successes. (I blame the kids in elementary school and junior high who would come up to me and, in a mean, accusing voice, say, “You get straight As, don’t you?” Which, for the record, I didn’t, but that wasn’t really the point.) I always forget to mention the important stuff, like that I’m actually published and that Disney Channel is working on the movie. Oh, yeah, and that it’s freaking hilarious. Oh, well. I like to think if they do end up looking up my book and reading the sample that they will be pleasantly blown away. Because, I mean, making cute crocheted toys is cool and all, but it doesn’t take nearly as much time and effort to learn as making awesome books does. What are your successes? What skillz do you have that other people underestimate? Went to the EMP/Sci-fi Museum here in Seattle this week. The sci-fi museum is probably my favorite museum ever because, well, to be perfectly honest, because it has things from TV. And I love things from TV! I mean, just look at that Dalek! I got to see that in real life and it was so amazing. Kinda shabby up close–was made in 1988–but still one of the most amazing things I’ve ever seen. You can see more pics over on my Pinterest board. This weekend was also ALA Midwinter here in Seattle. Got to hang out with lots of people and scored a bunch of ARCs. Didn’t get any writing done (sad), but feel refreshed and excited about books in general. This week in my Meaningful Gamification class, we’re studying behaviorism and how rewards are used to affect behavior. So basically people have studied how doling out rewards/in what ways they’re doled out affects learning. So if you have someone push a button to get a reward, but they only get a reward at one minute intervals, then they learn not to bother pushing the button until that one minute mark. But if you make the rewards come at random times, so that the person never knows when pushing the button will get them something, then they learn that behavior really well and it becomes an addictive “checking” habit. interesting skittery bug in the corner of the bathroom once, maybe twice, and now he’s hooked. No matter how many times he doesn’t see a bug in the corner, he can’t stop checking for it. And every time he checks, even if he comes up empty, it seems to reinforce the behavior, making him just want to do it more. Every time he follows me into the bathroom (he’s also obsessed with following me around everywhere, so maybe he’s prone to addictive behavior–I don’t know), he goes right to that corner and checks it out. Sometimes he’s in there just staring into the corner, hoping and waiting. And I often think, “Wow, that is sad!” And then I wonder if it’s really any sadder than checking the internets over and over. I mean, I’m pretty sure all my precious emails are a little more important than the possibility of there being a bug in the corner. But as much as I don’t care about chasing bugs, I’m sure Kitten is equally unimpressed by chasing emails. If getting to see a bug gives him the same spike of happiness, then is it really any different? Book wise, I have not forgotten about you all who are diligently waiting for The Trials of Renegade X. I’ve had to put it on hold for a bit while I work on finishing up my dark YA fantasy, Fire and Chasm, which needs to go back out on sub. And I’ve been working with the amazing Karen Kincy (author of Other, Bloodborn, and the upcoming Foxfire) on the Steampunk Book of Awesome. Two books at once is about all I can handle, but as soon as I finish up Fire and Chasm, I’ll be back to working on the Renegade X sequel. Knitting wise, I am working on my first original pattern (I’ve only made crochet patterns), and am also dying to make this Louhi coat. It’s the long gray one that looks really archaic and cool. I’m finishing up a cape right now and this hoodie (as soon as I actually buy the rest of the yarn I need), but man do I want to cast on and start that Louhi coat! It turns out I like making capes and coats and cloaks and things. And hoods. I can’t own enough coats and it turns out I can’t make enough of them either. Once upon a time, in 2004, in a faraway land called Bellingham, WA, where the sky, the earth, and the sea are all the same shade of gray, I got it into my head that I wanted a portable writing device. I had a desktop at the time and I wanted to be able to write anywhere, whether that meant when I was out of the apartment or just when I was sitting on the couch. I did a lot of research and discovered the NEC Mobile Pro. (Which, as you can see if you follow the link, is also gray.) It was super portable, had an actual keyboard (not full size, but it worked), and it turned on and off instantly, which meant no waiting for my computer to boot up in order to write down any brilliant plot ideas I had at one in the morning. I got a refurbished one off of eBay. It had a spot where you could plug in your dial up internet (LOL), and the one I got came with a WiFi card so you could connect to the network, even if it was kind of slow. But I never ended up using the internet on it. It was a little tiny box with Pocket Word and a word count meter and almost nothing else. There were no distractions, and it changed my life. Or at least my writing life, which was pretty much the same thing. Not only was it light and portable and I could sit wherever I wanted with it or write in the quiet room at the university library, but I became way more productive. And it’s not that I’d never experienced periods of high productivity with my writing, even with the internet, but it was so much easier to get into that mode without having the option of turning to distractions every time I got stuck. In the summer of 2007, the same summer I finally graduated college and the same summer that the last Harry Potter book came out, I wrote The Rise of Renegade X, all on that little computer. Then, two years later after I’d sold the book and gotten paid for it, I bought a shiny new laptop. I love my shiny not-so-new-anymore laptop that literally sparkles in the sunlight (there are blue sparkles on the lid, but they only show up in direct sunlight), and at the time I’d badly needed a computer that actually functioned, since my desktop was, on its good days, barely still functioning. So I got the laptop, and it did all the computery things I wanted it to do, like play games and play videos (with sound! and without blue screening at random times!) and check my email 1,000 times a day. And gradually I stopped using my MobilePro. My laptop didn’t have a spot for the sync cable, my MobilePro had no USB ports, and my laptop couldn’t read the card that the MobilePro could actually save to, at least not without hooking up a separate card reader, and the card itself was unreliable and would frequently forget everything that I’d saved on it. Anyway, since then I’ve been writing exclusively on my laptop, which has about a million distractions on it, including the internet, which I can’t stay away from. And if it’s not the internet, then it’s Spider Solitaire. And lately I’ve been especially prone to these distractions and I have a lot of writing projects I’m not making enough progress on, if any. So I decided it was time to go back to an internet-less computer. This netbook ended up being the perfect combo of everything I wanted. USB ports, card reader, runs actual Windows (instead of CE) so it can handle Open Office and doesn’t screw up formatting when I’m passing files between computers. It’s lightweight and gets almost 10 hours off one battery charge and it comes out of hibernating instantly, and the boot up time when I turn it on is super fast, too. And the keyboard, which you can see in this next picture, is just how I wanted it. Chicklet style with a hard base. I uninstalled any unnecessary programs, deleted all the games, and left the whole thing not connected to the network. It has my writing programs and that’s pretty much it. It’s amazing how big a difference not having those distractions makes! Instead of being unfocused and looking for ways to procrastinate, I’m actually, you know, working. Sometimes it pays to know what works best for you. If the internet is there, I will poke at it. I won’t be able to leave it alone, and I know this about myself. And it can make working on my laptop a source of stress. In contrast, the netbook feels like a quiet, stress-free workspace that is just me and my books and the tools to make them better. So you know that Garbage song, I’m Only Happy When It Rains? Yeah, well, it took me forever to realize that song was about being emo. Not like I’m actually only happy when it rains, but when you grow up in the NW, especially in some sort of black hole rain shadow, a rainy day is so comforting. I got on this subject because yesterday it rained, and it was cold and chilly and wet and we had the windows open so all of that could blow in. A good rainy day, where you can hear the rain outside and smell it in the air, always makes me feel safe and like everything is right with the world. It’s the kind of thing that makes you say, in all seriousness, “Wow, it’s a beautiful day today,” when you get up in the morning and everything is wet and cold and nostalgic. And it’s not like I like being wet and cold or anything. It’s funny how this kind of weather reminds me of walking to school back in junior high, and while I don’t remember particularly enjoying that part of my day–especially if it involved cold drops of water pouring over me–but the same weather now can make me think of those times and only pull out the good stuff, like the way the rain makes me feel so alive. I have a vitamin D deficiency, and some days, despite taking supplements, I sit here longing for the sun like nobody’s business. I feel like some withering old plant dying in the corner. And sometimes I think maybe one of these days I’m going to have to relocate to a place with actual sunlight. And then a rainy day comes along and I’m pretty sure I couldn’t ever leave here. Princess Celestia is normally the wise Christopher Robin type character of the show who’s older and more level-headed than most of the other characters. The Gandalf, the Dumbledore. You get the idea. Imagine Dumbledore saying, “My wings are so pretty!” like he means it. Would I have liked this toy as a kid? Maybe. I would have been happy to have a pony princess who was both a unicorn and a pegasus, and the light up wings would have earned it major points. But the fact that she’s not canon would not have sat well with me. The pink body, the completely wrong colored hair… That would have bothered the hell out of me! I have meant to post a million times these last couple weeks, but it kept getting away from me. Blog posts are always skittering away as soon as I turn on the light. Or, in a less creepy metaphor, they’re like Lucy and the football. If you live in the NW, I got an artist’s table at GeekGirlCon, August 11th and 12th. Come stop by and say hello! I also went to Comicon a few weeks ago, and it was amazing! I hung out with author pal Karen Kincy and got to meet Tara Strong, the voice of Twilight Sparkle (and Batgirl in Batman: the Animated Series, Timmy in Fairly Oddparents, Rikku in FFX, Bubbles in Powerpuff Girls, Harley in Arkham Asylum and Arkham City, and she’s been in about a million other things, too). She was so nice and great to see in person! I gave her a stuffed Twilight Sparkle I made her and she was amazed and hugged it and let me take pics! John DiMaggio, the voice of Bender on Futurama, was in the next booth over, leaving voicemails for fans from an angry Bender. I got to go to the Futurama panel as well as the Batman panel, and everyone was amazing. I’m definitely hoping to go again next year!